When we first moved to Raleigh to join Geomagic, one of my first home improvement projects was to install a low voltage lighting system around my house - including a few driveway lights to mark the edges of the driveway. This was my first mistake: I should have realized that with active boys, the weather that we've got in Raleigh, and all manner of sticks, balls, bikes, nets and other hitting implements in our garage, that it was only a matter of time that I would be removing them - or I should say - they would be removing them. No worries, I thought, I'll plan ahead. Rather than worry about it, I'll just go ahead and buy a dozen or so (yes, a dozen) complete replacement lights before they were discontinued and stick them up in my attic. I figured that would give me a 5 year supply (at least). When one got damaged, I would just replace it, no worries indeed. This was my second mistake: I should have purchased two dozen, or maybe three. Between various incidents with the boys (several were taken out by basketballs, one amazingly by a football - while in the air mind you - two by bikes), guests (at least three went that way, two by the same guest, what can you say? 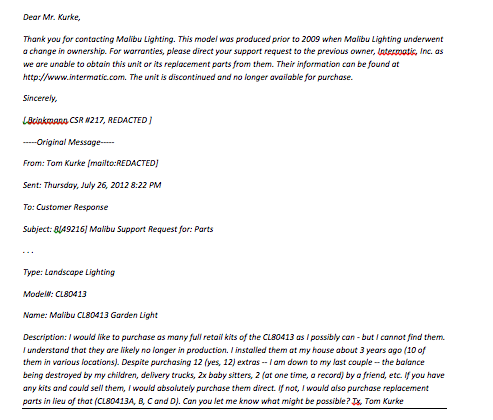 ;-), and delivery trucks (it is a sight to be seen what"Brown can do for you" when a large delivery truck takes on a small aluminum driveway light), I saw my stock dwindle to only three remaining lights, and a bunch of bits from other destroyed ones I had removed. In pondering the alternatives - I thought, OK, I'll replenish my stock. Off to a trusty Google search, a look on Ebay and, to my chagrin, nada. Nothing. Well,given that I purchased these in 2009, and how fast retail moves, that didn't really surprise me all that much. 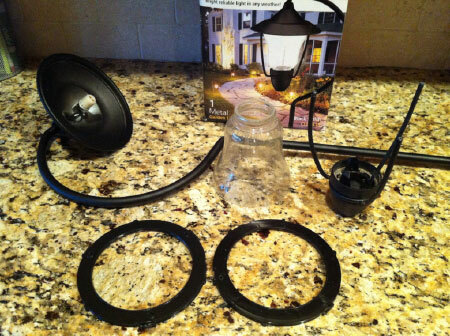 So I looked at the bits that remained and realized that several of the lights were really just missing one piece - a retaining ring that holds a glass cover to the main body of the landscape light. In many cases locking tabs on the retaining ring had merely sheared off (and so the glass cover could no longer be attached). OK, I'll try the manufacturer. For sure they'll have just boxes and boxes of replacement parts. I'll just use the handy dandy parts sheet in one of the boxes, fire off a note to customer support, and I'd be all set. Well, not exactly. OK, what do I do now? Well, I had an ace in the hole. 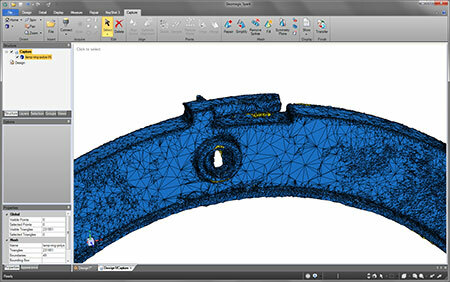 In late July 2012 we were already deep into our partnership with SpaceClaim and creating Geomagic Spark. 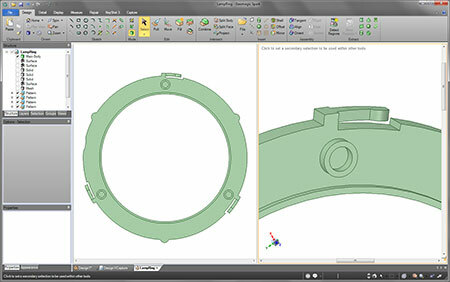 Geomagic Spark is a game changing product built on an OEM version of SpaceClaim - combining live 3D scanning, point and mesh editing, a direct modeling CAD toolset, assembly construction and 2D drawing creation all in one package. I went to Kevin and challenged him to create me some replacement rings - using one of the broken originals as a template, processing them in the very alpha code which became Geomagic Spark, and then 3D printing me a bunch of replacements. It was a great proof-of-concept for a product we were designing to be useful with less than ideal scan data, yet which could produce manufacturable parts quickly. I had to hold this blog post until the official release of Geomagic Spark - I didn't want to be the one to let the cat out of the bag with my personal project! When Tom first showed me the ring, it looked like the perfect candidate for our early versions of Spark a very"CAD-like" shape, in that it was simple geometry like planes, cylinders and revolves. The first step, of course, is to digitize (OK, scan) one of the existing, not-too-broken rings. I used a laser scanner to capture the majority of the ring, knowing I did not need the whole thing scanned since the part is circular and thus we only need a portion of it to extrapolate what is missing. The scan data is then turned into a mesh in Spark by a process called"wrapping", which has been a Geomagic specialty for years. Armed with the mesh, it was time to convert the mesh into a solid something that is not easily done in traditional CAD applications. Through a process of feature extraction, where Spark can recognize shapes in the mesh (like the aforementioned planes, cylinders and revolves), solids are created directly from the mesh. And since Spark is built on SpaceClaim, it was very easy (dare I say, fun!) to combine those solids together to create the final result. And to prevent these new rings from breaking so easily, I added a little extra thickness to the tabs on the outside, hoping they might be more robust. 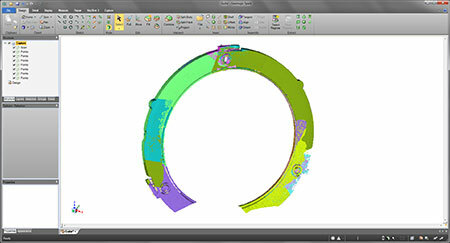 To the right are a series of screen grabs, showing the scan data in Spark, mesh created by Spark, and the solid model. Below is a picture of the first 3D print (in blue) made from the resulting Spark CAD model (if you look at about the 10:00 position on the original, black retaining ring you will see one of the broken tabs). This first print did not fit quite right the clearances are actually surprisingly tight. But no problem, back to Spark and a quick pull here, a push there, hit Print and one hour later, a new ring that fits perfectly! 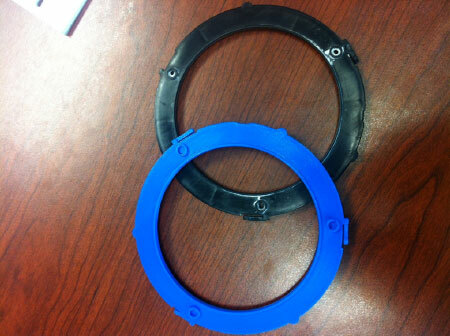 I had Kevin re-print a few of the rings in black so that they weren't noticeable in the installation. Below is a picture of all of the bits and parts of one of the low voltage lights, the replacement retaining ring is the one on the right. Please download a trial of Geomagic Spark and give it a whirl on one of your own projects!